CBI investigated the effects of climate and vegetation on the distribution of martens (Martes caurina) and fishers (Martes pennanti) in the Sierra Nevada in California under current and projected future conditions to inform conservation efforts for these species and to investigate how different modeling methods and resolutions may affect predictions about speciesâ€™ responses to climate change. Martens and fishers are closely related forest carnivores of conservation concern in California, where both reach their southernmost distributions. 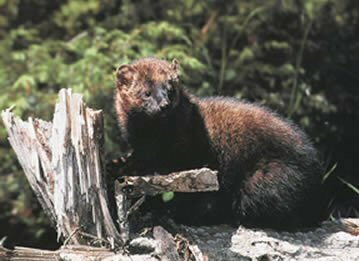 The species have contiguous elevation ranges, with the smaller marten occupying high subalpine forests that experience deep and persistent snow, and the larger fisher occupying mid-elevation forests that experience less snow and warmer temperatures. add robust, downscaled, climate-change effects assessments to CBI's Sierra Nevada Carnivores project, which is a comprehensive, science-based effort to map areas important to sustaining rare carnivore populations and improving forest management. compare alternative analytical approaches and resolutions for assessing climate impacts on vegetation and sensitive species. Because martens and fishers require similar forest structural conditions (dense forests with large trees and abundant dead wood) but different climate regimes (cooler, moister, and snowier conditions for martens; warmer, drier and less snowy conditions for fishers) they offer a unique opportunity to investigate how our changing climate may affect the species directly as well as via changes in vegetation. Also, because they compete with one another for food, and fishers will kill martens when they meet, this system offers an opportunity to investigate how species interactions may also affect future populations. Examine how the current distributions of martens and fishers are influenced by vegetation characteristics (e.g., forest composition and structure), climate (e.g., temperature, precipitation, snow depth and duration), physical variables (e.g., elevation, % slope) and presence or absence of the other species. Project the potential future distribution of both species under climate change based on results of Task 1 and using alternative emissions scenarios and general circulation models at different resolutions. Use the results to support conservation and forest management plans to ensure long-term sustainability of marten and fisher populations in the face of climate change and increasingly severe fire regimes.